Escape to the picture-perfect Cook Islands for an idyllic beach holiday. Book a Rarotonga holiday package deal and save time and money planning your next trip abroad. Webjet curates the top airfare and hotel specials to make sure you get excellent value at the best price. Enter your travel dates, browse a wide selection of the top hotels and you're done! All that's left to do is pack your bags and get ready to unwind on the pristine sandy white beaches. Start searching the latest Rarotonga holiday packages from Australia with Webjet's powerful search engine. There are daily flights from Australia to the Cook Islands. The best route is to fly from Sydney (SYD) to Rarotonga International Airport (RAR) with Air New Zealand. It's the only airline the operates a direct route with a flight time of 6 hours 10 minutes. If you're flying from Australia's other major cities like Melbourne, Brisbane or Perth, you can get a flight with a stopover in Auckland with Air New Zealand. However, it will increase your total journey time to over 10 hours. Other airlines that operate between destinations in Australia and the Cook Islands are Virgin Australia and Qantas. Rarotonga boasts incredible accommodation options for travellers. Whether you're looking for all-inclusive resorts on the beach front, low-key villas or adult only sanctuaries - there's something to suit your needs and budget. The Rarotongan is one of the best full-service resorts on the island. It's located on a secluded part of Aroa Beach and offers guests incredible sunset lagoon views. Your room rate includes a range of free extras including a free buffet breakfast and daily activities such as snorkelling tours. Kids under 11 can also stay for free, making it a fantastic option for Australian families. Nestled on a secluded beach are Sea Change's 12 boutique villas. Each villa boasts a private swimming pool with breathtaking views of the nearby lagoon. Choose from one, two, or three bedroom options and enjoy complete privacy in paradise. It's the perfect choice if you're celebrating a special moment or looking for a rejuvenating getaway in the Cook Islands. Sanctuary Rarotonga is an adults-only accommodation option on the island. You'll have access to one of the best beaches in the area with enough privacy to reconnect with your loved one. Inside your suite, you'll find exquisite details like black pearl shell accents, a raintree vanity and an island-style thatched roof. Choose from beach level units or rooms higher up for incredible views of the lagoon. The Cook Islands are one of the worlds most off the grid destinations. Encompassing only 240 square kilometres of land in the middle of the Pacific Ocean, it's the perfect remote island getaway. Rarotonga is the capital and boasts sandy white beaches, coral reefs fringing the coastline and more palm trees and sunshine you could hope for. Located on the sunset side of Rarotonga, there is no better place to watch the day end in style. Sit on the beach or head over to the Shipwreck Hut. It's considered one of the best beach bars on the island, and it's a great spot to listen to some live music with a bottle of local Matutu Beer in hand. The calm waters of Muri Lagoon are ideal for water activities. You can hire a paddleboard, kayak or try your hand at kite surfing. You can hire everything you need from shops on the beach and rent it out for as long as you need. After you've worked up an appetite, you can stop at one of the nearby restaurants or bars for a cocktail. The Punanga Nui Market is one of the South Pacific's top markets. If you're an early riser, head over to the market for breakfast. You can wander from stall to stall and fill up on all the delicious treats while sipping on freshly squeezed tropical punch. Afterwards, shop around for some beautiful island souvenirs like black pearls or ukeleles. 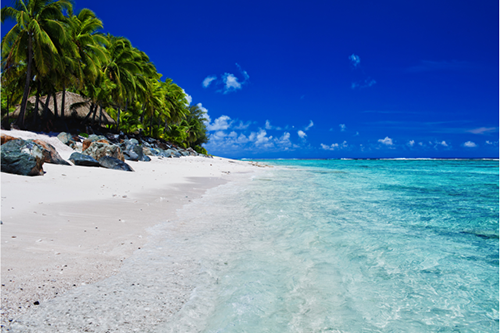 The best time to visit Rarotonga is between May and September. The weather is at its best with temperatures hovering around 26°C. However, the island is at its busiest from July to August. If you're planning your trip between these months, you'll need to book your trip in advance to lock in cheaper Rarotonga accommodation and flight packages. The island experiences its low season during November and March. The rains keep the crowds away, but if you can handle the less than perfect weather, you'll find better deals from hotels and tour operators.